Oceanfront Luxury! - Affordable Oceanfront Condo Now with A/C!! Imagine - warm tropical climate, gentle sounds of waves washing ashore, palm trees swaying in the breeze, panoramic views, luxurious and comfortable accommodations - is there any other way to experience Hawaii? This one-bedroom, one-bath condominium epitomizes the lavish lifestyle at its best. Travertine floors, granite countertops, full gourmet kitchen, state-of-the-art appliances, and million-dollar location make this unit the prime destination of couple's seeking to vacation in absolute bliss. Robin Ledson, owner and Holly Cunningham, manager. New Split System A/C!! As good as central A/C in this one bedroom condo!! The condo could literally not have worked out better. It was exactly as represented in the descriptions and especially the pictures. Some of the reviews referenced that the complex could have been updated some and I can see where the complex doesn’t have the initial hit you in the face wow factor. However, the pool area and just general grounds were maintained without any complaints by me for our five night stay. The pool and surrounding area was cleaned daily. More importantly, the actual condo was breathtaking. To arrive and have the large sliding glass doors open for the cooling ocean breeze and sound of the waves on the rocks directly below the lanai was the wow factor. Upon opening the front door the breeze and sound pulled us immediately to the view that was heartbreaking to leave at our departure. All communications with booking, paying, arrival, etc. were fabulous and we are trying to figure out when (not if) we can make it back and will definitely be scheduling any future trips around this units availability. Kona Bali Kai is a property located just south of downtown Kona. The units on the ocean side of Ali Drive were built in 1973; many have been updated with great attention to detail. The building is of cinderblock construction and is well maintained. 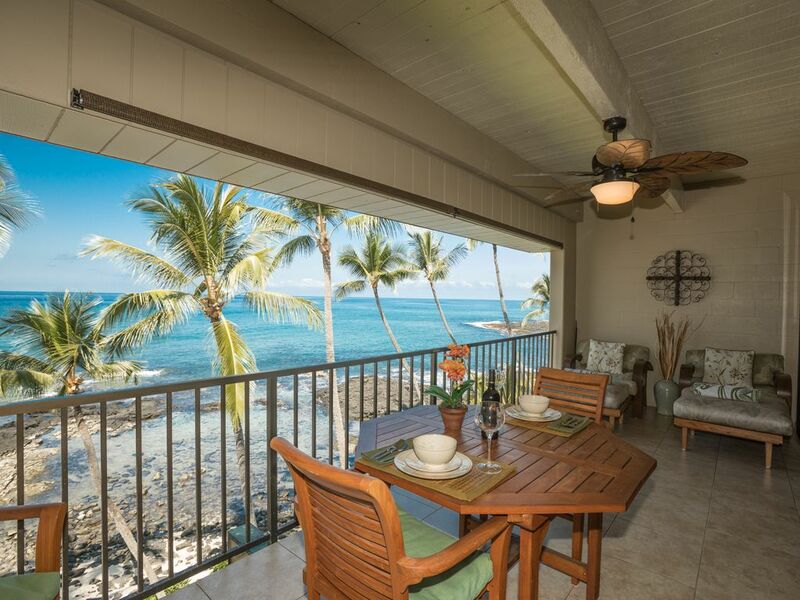 The lanai is very private without hindering the wonderful ocean view. The Pacific provides the ultimate white noise! Condo 416 is located on the top floor of this complex at the north end of the pool atrium; its level is accessible via elevator. The parking is located at ground level under the condo complex along with the lobby on the Ali Drive and the pool atrium. The pool has been recently renovated. It has a wide shallow area that steps down quickly to 4’. The shallow area is large enough for small ones to play; just be cautious of that next step; the deepest part of the pool is 7’. There is a small adjoining hot tub. The down side of the pool location is the proximity of the pool to the parking; the plus side is that the pool is protected from the ocean breezes and has some shade throughout the day. The unit has tile floors, granite counters, Calphalon cookware, just about any small appliance or utensil, spices, foil, plastic wrap, laundry soap, dishwasher and dish soap, loads of bath and beach towels, beach chairs, cooler, insulated bags, boogie board, snorkel set. Simply put, pack your clothes and toiletries and leave everything else home! All you need to pick up are food and beverages. The unit layout is great and the small vestibule blocks the view into the unit from the atrium passageway. The beautiful wood paneling enhances the warm feel of the condo as well as the quietness of the unit. All the interior doors are heavy wood louvered doors, including the sliding panels that can close off the bedroom. The lanai is very spacious with comfortable seating. There were days, we just spent the day on the lanai watching the turtles in the tidepools and the surfers just to the south. We ate all our meals on the lanai. Two gas grills located on the lawn on the ocean side at either end of the property (4 total). These are cleaned every morning and covered at night. It was a bonus having them and an extra bonus that the unit is was not affected by them. Holly was wonderful to work with and quick to respond to any question or request. This was a truly wonderful stay and in case you also want to go, just know we have already reserved our time for next year. Aloha. The condo was clean, neat and well appointed. The property grounds were well maintained and the atmosphere happy. We truly enjoyed our stay here while on the Big Island for nearly two weeks! We had never stayed on the 4th floor before and enjoyed it every bit as much as on the 2nd floor. Condo was clean, very comfortable and had a great kitchen and nice bathroom with walk-in shower. We were able to leave the sliding patio doors open all night and listen to the pounding of the waves against the lava rock, which is a sound that is so relaxing to both of us! Holly is so friendly and great to work with that renting this condo was very easy. Great way to spend my 65th Birthday! Unbelievable property - the best in Kona! This condo is even more stunning in person than the pictures portray. Incredibly well appointed, perfect location and come on...you can NOT beat the views off of the balcony. We slept with the sliding doors open constantly, lulled to sleep by the crashing surf, waking up to watch the surfers on the next beach over. It’s absolutely idyllic to say the least - we will definitely be coming back!! Great location, amazing view and incredibly comfortable. This is a wonderful property for two. Amazing view of the ocean. Well appointed condo with a very workable kitchen filled with everything you might need to make a meal. Don't miss Da Poke Shack at the property. Awesome food! VRBO and the owner were very easy to work with. Everything about this place is great! and don't forget the Mai Tai's at The Kona Inn! !